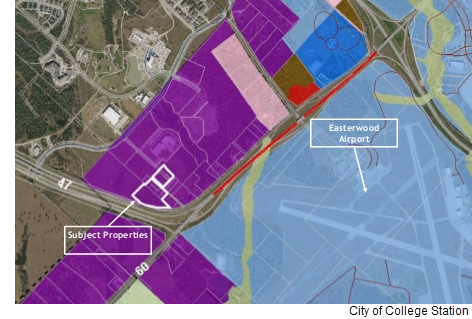 ​​ COLLEGE STATION – City Council voted to rezone property just north of Easterwood Airport for multifamily housing. The property involves 11 acres at Hwy. 47 and FM 60, in the path of a secondary runway, where only 5 percent of takeoffs or landings occur. Airport officials opposed multifamily housing due to its proximity as a non-conforming use based on FAA regulations. They were also told the height of the multifamily buildings will not be an obstruction.